HUNTSVILLE, Alabama, January 18, 2011 (ENS) – For the first time, antimatter has been observed occurring naturally on Earth, as scientists using NASA’s Fermi Gamma-ray Space Telescope have documented beams of antimatter produced above thunderstorms. The scientists think the antimatter particles are formed inside thunderstorms in terrestrial gamma-ray flashes associated with lightning. They estimate that about 500 gamma-ray flashes occur daily worldwide, but most go undetected. “These signals are the first direct evidence that thunderstorms make antimatter particle beams,” said Michael Briggs, a member of Fermi’s Gamma-ray Burst Monitor team at the University of Alabama in Huntsville. He presented the team’s findings last week at the American Astronomical Society meeting in Seattle. Antimatter is one of the mainstays of science fiction but it is “rare in the present-day universe,” NASA says, explaining that antimatter is called the “mirror image” of ordinary matter, because for every type of ordinary matter particle, an antimatter particle can be created that is identical except for an opposite electric charge. Antimatter is created in solar flares on the Sun and clouds of antimatter have been observed in the Milky Way, our home galaxy, but the phenomenon has never before been seen on Earth. Acting like enormous particle accelerators, thunderstorms can emit terrestrial gamma-ray flashes, called TGFs, as well as high-energy electrons and positrons, which are the antiparticles of electrons. 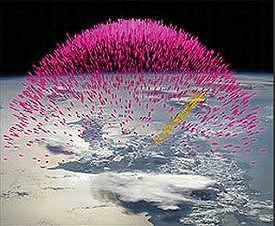 Moving near the speed of light, these particles travel into space along Earth’s magnetic field. The NASA scientists now think that most terrestrial gamma-ray flashes also produce particle beams and antimatter. Launched June 11, 2008, NASA’s Fermi Gamma-ray space telescope is designed to monitor gamma rays, the highest energy form of light, from its orbit 350 miles above the Earth. When antimatter striking Fermi collides with a particle of normal matter, both particles immediately are annihilated and transformed into gamma rays. The Gamma-ray Burst Monitor has detected gamma rays with energies of 511,000 electron volts, a signal indicating an electron has met its antimatter counterpart, a positron. Although Fermi’s Gamma-ray Burst Monitor is designed to observe high-energy events in the universe, it also provides insights into the antimatter phenomenon. The Gamma-ray Burst Monitor constantly monitors the entire sky, circling the Earth every 90 minutes. The Gamma-ray Burst Monitor team has identified 130 terrestrial gamma-ray flashes since the Fermi space telescope was launched. For most of terrestrial gamma-ray flashes that were observed, the space telescope was located immediately above a thunderstorm, but in four cases, storms were far away and the only lightning at the time was hundreds of miles away. During a terrestrial gamma-ray flash on December 14, 2009, the Fermi telescope was located over Egypt. But the active storm was in Zambia, some 2,800 miles to the south. The distant storm was below Fermi’s horizon, so any gamma rays it produced could not have been detected. The beam continued past Fermi, reached a location, known as a mirror point where its motion was reversed, and then hit the spacecraft a second time just 23 milliseconds later. Each time, positrons in the beam collided with electrons in the spacecraft. The particles annihilated each other, emitting gamma rays detected by Fermi’s Gamma-ray Burst Monitor. Scientists long have suspected terrestrial gamma-ray flashes arise from the strong electric fields near the tops of thunderstorms. 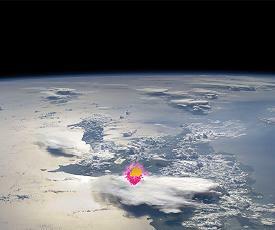 Under the right conditions, they say, the field becomes strong enough that it drives an upward avalanche of electrons. Reaching speeds nearly as fast as light, the high-energy electrons give off gamma rays when deflected by air molecules. Normally, these gamma rays are detected as a terrestrial gamma-ray flash. But the cascading electrons produce so many gamma rays that they blast electrons and positrons clear of the atmosphere. This happens when the gamma-ray energy transforms into a pair of particles: an electron and a positron. 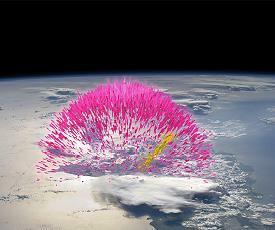 It is these particles that reach Fermi’s orbit 350 miles above the Earth.